Last week Gideon mentioned 5 good reasons why you should start using Facebook Video Ads for your business. Of course, he was being quite modest there, ’cause we believe there are actually way more than 5 reasons. Heck, maybe even 50! If you care about getting quality traffic to your website for LOW costs, you need to get in the game now! To make it super easy for you, we are offering you an entirely FREE Facebook Video Ad Template you can use to get started. ‘Cause let’s be honest… It’s quite likely that you’re BUSY with a capital B if you’re running a business. 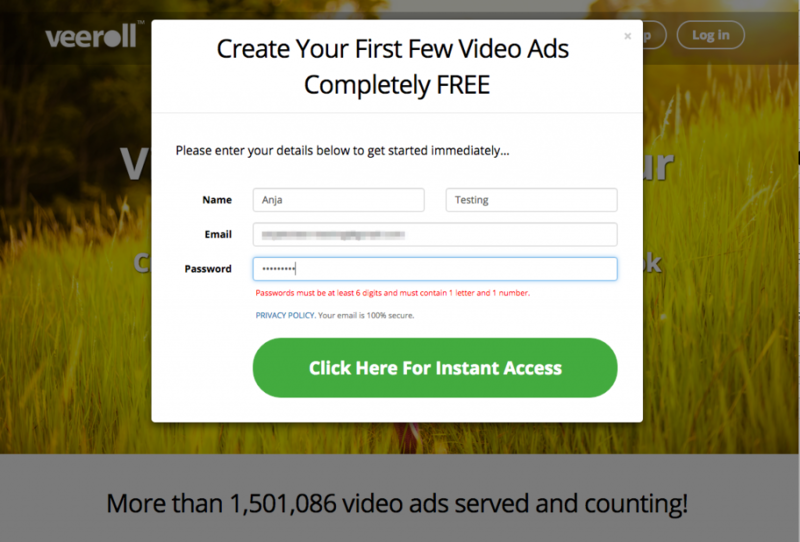 And creating your own video ads is just way too time-consuming. Or, you simply don’t want to be featured in your own ad because video just kinda isn’t your thing (that’s OK) or you don’t have the budget to hire someone to do it for you. Well, no fear dear business owner! 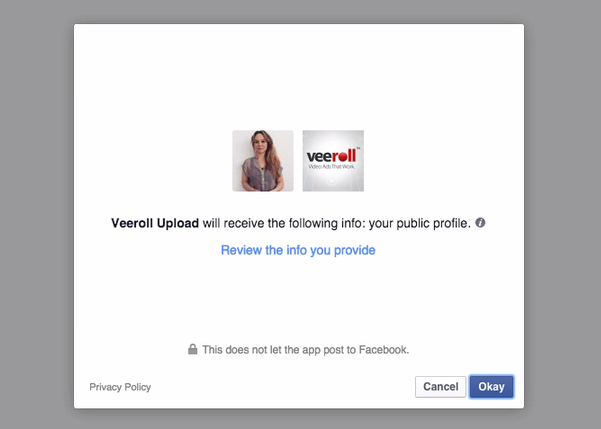 You can join the Facebook Advertising trend RIGHT NOW by simply creating a FREE Veeroll account. In this post, I’m going to show you exactly how to get started and how to make your first FREE Facebook Video Ad. In fact, we have provided each new account with 4 video credits, which means you can indeed… create 4! If you’re not the reading type (we cater to all!) simply hit play on the video at the top of this post to get a walkthrough of all the steps. First of all, you’ll have to create your FREE account. 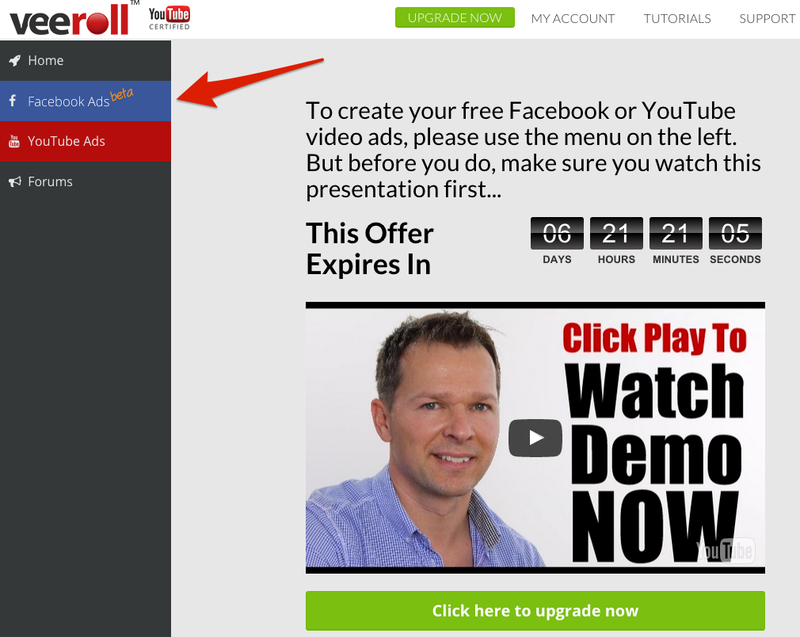 Simply go to http://veeroll.com and hit the beautiful green button that says “Create Free Video Ads”. Then, you’ll see this screen which will ask you for your name and email address and you can choose a password. Yep, that’s all for step 1! Told ya it was easy! When we say instant, we mean INSTANT. When you log in you’ll be immediately welcomed by Gideon! But for now (sorry G!) we’re going to click on Facebook Ads right away. Then, click Create and go to Free Template. Here you’ll see the beautiful and highly converting “Handwriting” Template that we’ve selected for you. When you click Select you’ll go to the next page where you can choose your style of music or … no music at all! Now…whether you’re into hip-hop, electro, rock or French chansons, you will find something to your liking. And, if you’d rather keep it silent this is always an option. (there are in fact more music options than you can see in this screenshot, this is just a selection). Once you’ve found the tune you like, you can click Submit Your Selection. Then it’s time to enter your own lines of text! If you have no idea how to get started with this, make sure to check our Script Writing Guide that we link to inside the interface. Or, check out this blog post that goes more in depth on how to write effective video scripts. In the next screen you can enter a title (just make it something that is easy to remember later) and your custom lines of text + a link to your website. 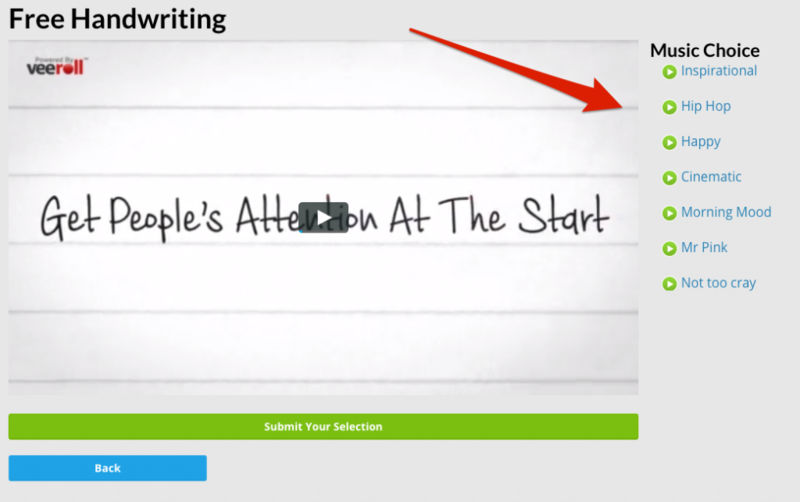 Just click Submit Customisation and wait for your video ad to be completed! This typically takes about 15-20 minutes. So, go brew some coffee or make your favorite tea in the meantime and wait for your email notification to come in. Now all you have to do is click the link inside the email. Once you do that it will take you straight to Facebook if it’s the first time you’re doing it. That is because you’ll first have to give our app permission to manage your profile and pages. You’ll have to click Okay not once, not twice, but three times indeed! In the second window, it will ask permission to post on your personal page. You don’t have to worry about that (it’s just a general permission scheme we have to use) because we’ll never do that. Not gonna happen! Once you click Okay 3 times you’ll be redirected to Veeroll once again and will see the following screen. Here you can fill in some basic details for your video ad: which page you want to post to, your website, what kind of CTA you want to use, etc. 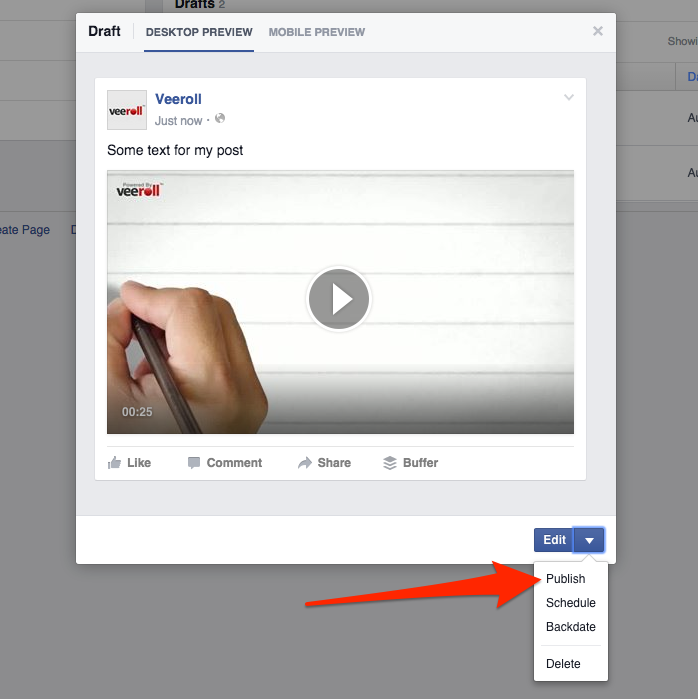 Just click Upload and then your Video Ad will be uploaded to Facebook as a draft. This means it won’t be published right away and you get to decide what to do with it and when! 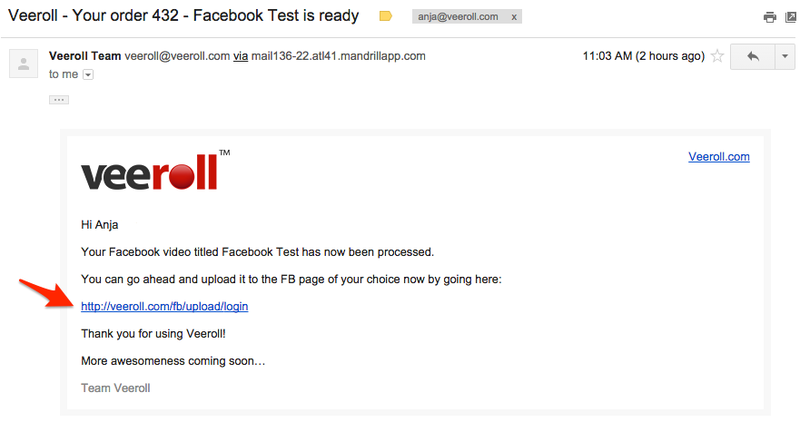 Now you can go to Facebook and will likely get a notification within 1 minute or so that your video has been processed. 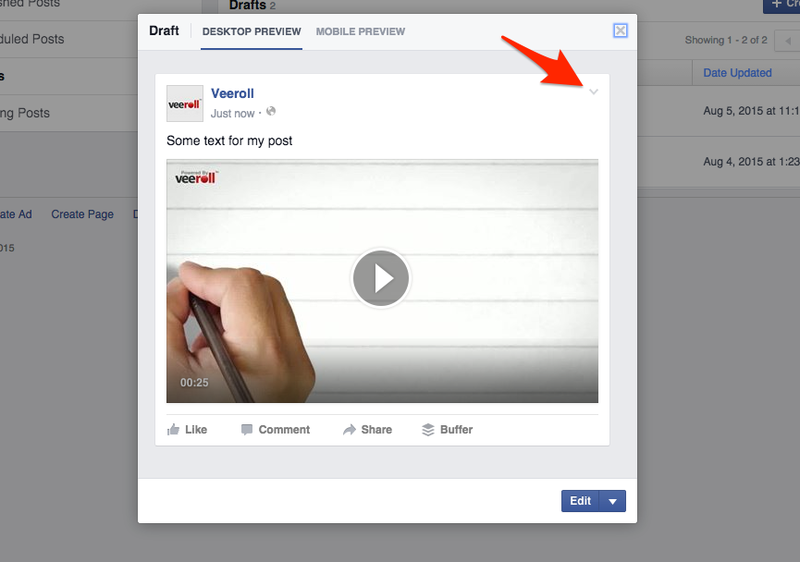 You’ll find your newly uploaded draft when you click on Publishing Tools on your Facebook Page and then Drafts. If you want to, you can now download the video to your computer for later use (for example in the Power Editor, which we’ll talk more about later). To do this you’ll simply have to click on the video, and then you’ll see the following popup. Click on the tiny little arrow (where the big arrow is pointing to) to go inside the video options. Not exactly super obvious, but hey, that’s what this tutorial is for. Then you’ll see the option to Download your Video. Hallelujer! Of course, you could also choose to Publish the video to your timeline. In the screenshot below you’ll see how to do that. 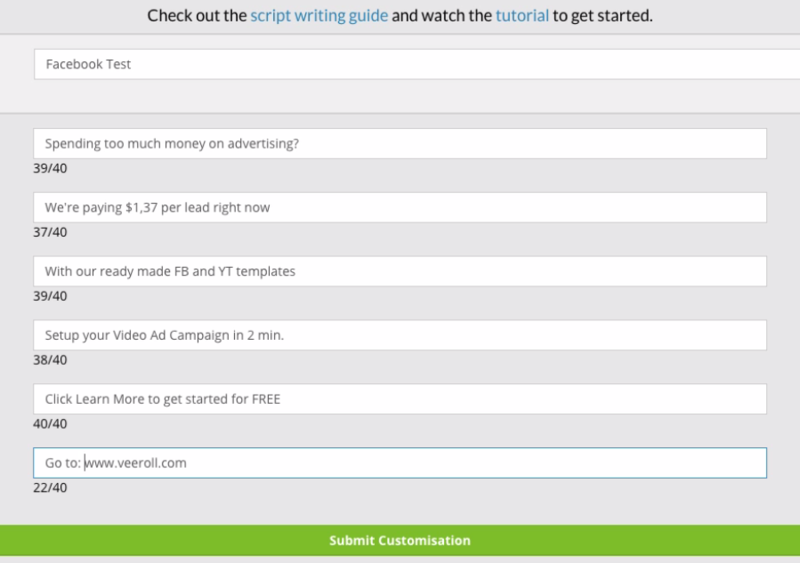 Once it’s published you can choose the option “Boost” as an ad. Go to http://veeroll.com to sign up for a FREE account. 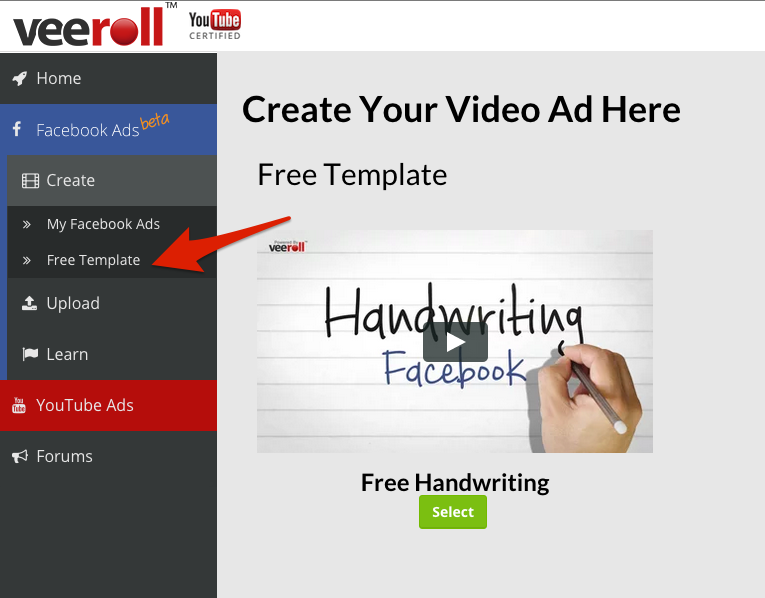 Create your first FREE video ad. 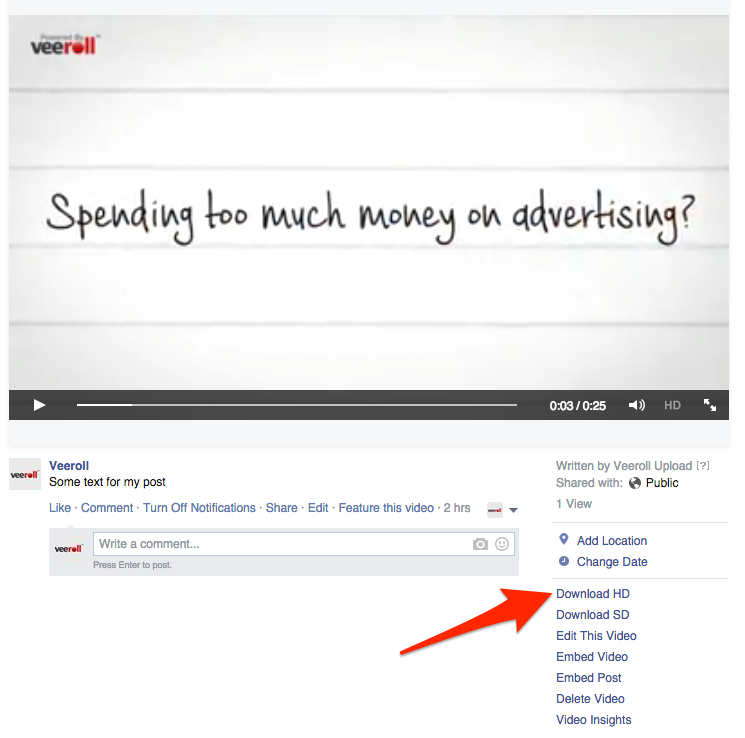 Upload your ad to Facebook! Do you have any questions so far? Don’t hesitate to leave a comment below. And of course, feel free to share this post with your business buddies! 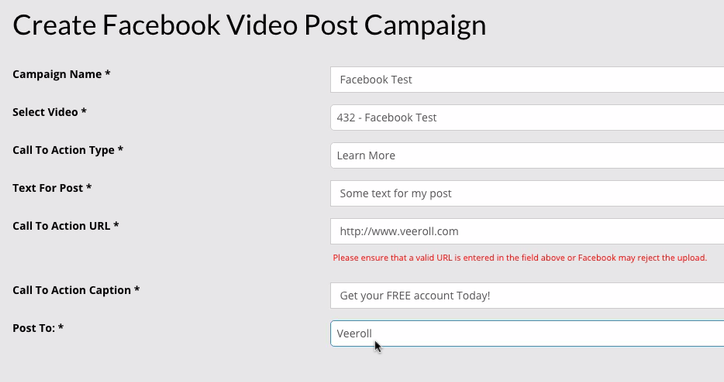 Create a FREE Facebook Video Ad with Veeroll!